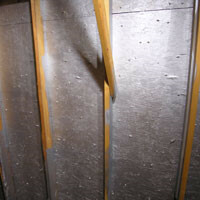 Often referred to as a Spray Radiant Barrier or Radiant Barrier Paint, technically LiquidFoil™ is an IRCC (Interior Radiation Control Coating). LiquidFoil™ attic radiant barrier paint is the highest performing IRCC coating on the market, integrating a tremendous 84% reflectivity with a permanent adhesion to resist flaking off over time. This insulating spray paint is permeable so as not to trap moisture on either side. LiquidFoil™ is also water soluble for easy clean up. 2. Prior to attic radiant barrier spray application, hand stir or use low speed mechanical mixing. 3. Use one of the approved methods to apply a single coating to the surface. 4. Clean up radiant barrier spray equipment with soapy water according to manufacturer's instructions. Insulating Radiant Barrier Heat Paint Spray Equipment: Recommended spray pump size of ™ GPM or greater, 2,000 psi, and tip size of 0.021™. It may be neccessary to remove filters from the spray rig prior to spraying. By Hand: The product can be rolled with a 3/8" to 1/2"™ synthetic nap roller or painted with a nylon or polyester brush, however, roofing nails penetrating the surface may make rolling or brushing difficult. 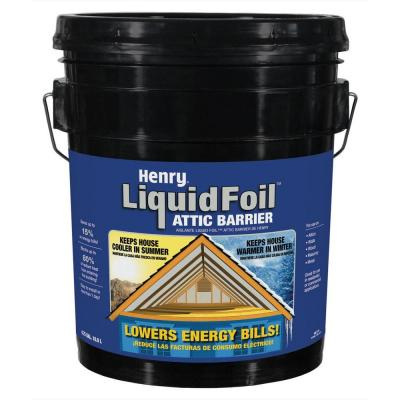 *LiquidFoil™ 5 gallon kits contain 4.75 gallons and typically yield 1,540 to 2,020 sq. ft.